Join the Crusade, support your regions NPL team and local sporting talent with a Magpies Crusaders membership. Apply for membership via the online membership application form below or in person at Magpies Sporting Club, 1 Glenella Road, Mackay. Please allow 24 hours before collecting your membership kit from Magpies Sporting Club, ID will be requested upon collection for security purposes. All members receive a personalised membership card, branded lanyard with card holder, bumper sticker, members only e-news and voting rights for the members choice player of the year award plus all the extras included in your chosen membership. 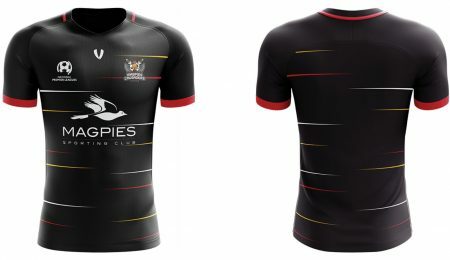 There is a membership type to suit you with extras including replica jerseys, non-ticketed and ticketed with discounted entry prices or season passes. CADET Under 18 $39.99 (Valued at $73.49) 15% off the entry price to all 2019 home games and a replica jersey. CHIEF Under 18 ticketed $99.99 (Valued at $122.49) A season pass to all 2019 home games and a replica jersey. CRUSADER 18+ $9.99 (Valued at $29.50) 15% off the entry price to all 2019 home games and complimentary Magpies Sporting Club social membership with associated benefits and discounts. CHAMPION 18+ supporter $49.99 (Valued at $89.49) 15% off the entry price to all 2019 home games, a replica jersey and complimentary Magpies Sporting Club social membership with associated benefits and discounts. COMMANDER 18+ ticketed $139.99 (Valued at $187.49) A season pass to all 2019 home games, a replica jersey and complimentary Magpies Sporting Club social membership with associated benefits and discounts.